The HeartShare St. Vincent’s Services team was joined by Quadra and Habitat for Humanity for a ribbon cutting ceremony on Tuesday, December 11. (left to right) Robert Sablic (Quadra CEO), Regina Mitchell (HSVS Wyckoff Gardens Cornerstone Program Director), Brooke Rosenthal (HSVS Vice President of Youth Development and Community Programs), Briana Fullwood (Habitat for Humanity Manager of Corporate Partnerships), Nicole Haworth (Quadra Managing Director), and Nicole Bootz (Quadra Designer). HeartShare St. Vincent’s Wyckoff Gardens Cornerstone Program unveiled its renovated program space made possible by Quadra Furniture & Spaces and Habitat for Humanity on Tuesday, December 11. “HeartShare St. Vincent’s Services is thrilled to be selected as a recipient of this generous donation made possible by Quadra and Habitat for Humanity, who referred us for the project. Our Wyckoff Gardens Cornerstone Program is now freshly painted, and has two newly furnished classrooms, a computer room and lounge. It looks like a completely different space,” said Brooke Rosenthal, Vice President, HSVS Youth Development and Community Programs. The HSVS Wyckoff Gardens Cornerstone Program, which opened last fall in Boerum Hill, offers after-school and summer camp options for those five and older. “The Cornerstone program model is a unique one that cultivates an intergenerational community from elementary school students to senior citizens who utilize the Wyckoff Gardens Community Center. Thank you for creating a safe, beautiful space for all of us,” Rosenthal added. ”We are so thankful for our partners at Quadra for their generous donation of new furnishings to the Wyckoff Gardens Community Center and for volunteering their time to help improve a cherished neighborhood meeting place,” said Karen Haycox, CEO of Habitat for Humanity New York City. Quadra is a New York-based furniture rental and staging company with a long history of community partnerships and supporting organizations like Habitat NYC. With its ongoing donations of designer furniture and décor, Quadra has become the top contributor to the Habitat NYC ReStore, where proceeds of donated furniture, etc. support Habitat’s work to build and preserve homes for hard-working, low-income families. 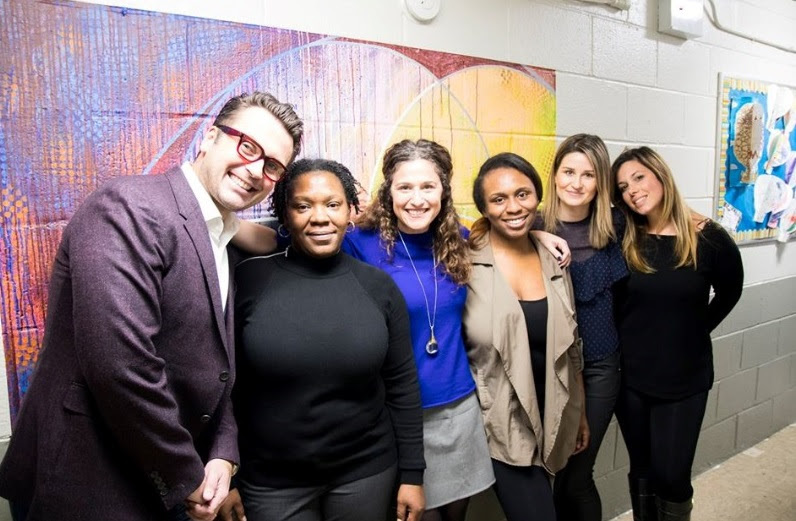 In addition to donating furniture, colorful décor, new mobile Swiftspace workstations, and tech enhancements like flat screens and the latest gaming system, Quadra partnered with non-profit arts organization Chashama to bring original art into the mix. The artist Kristin Reed, with her distinct expressionistic use of light and color juxtaposed with graphic geometrical symbols, painted an inspiring mural. “Youth learn a lot about who they are and what they deserve from their environment. With this donation, our children and teens will want to spend more time at Wyckoff Gardens after school and during summers. They can be proud of the community they belong to, and feel even more encouraged to reach their academic and personal goals,” said Regina Mitchell, Director, HSVS Wyckoff Gardens Cornerstone Program. The HSVS Cornerstone Programs offer tutoring, recreational activities, creative arts and sports. HSVS has four other Community Programs in Brooklyn, including the McKinley I.S. 259 Beacon Program and P.S. 102 One World COMPASS Program in Bay Ridge, as well as the P.S. 288 Shirley Tanyhill Beacon Program and Surfside Gardens Cornerstone Program in Coney Island. HeartShare St. Vincent’s Youth Development and Community Programs educate and nurture over 3,600 youth into successful adults. Through the delivery of innovative services, we encourage the participants in our community programs and our youth in foster care to make positive connections, expand their experiences and achieve their dreams.